I wanted to show people that family is more than what it seems. If pets could talk, what would they say? Would they recount your good times together or remind you of what could have been? Patricia Rashke and her late husband Don believed that man’s best friend has a lot to say, if only given a chance. Before Don died, he had been working on a book called “Adventures of Mustang Sally,” which introduces readers to the couple’s Staffordshire Bull Terrier named Mustang Sally and the story of their family, as told through the dog’s viewpoint. 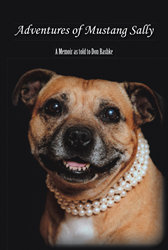 Following the family through love, loss and the challenges and joys of pet ownership, “Adventures of Mustang Sally” shares an interesting perspective on the inner-workings of what connects a family and what it’s like to know love, loss and the comfort of a family to call your own. After her husband’s death, Patricia completed and published “Adventures of Mustang Sally” in an effort to fulfill her husband’s wishes to finish his work. Staffordshire Bull Terrier Mustang Sally is a retired AKC dog show competitor with five champion pups of her own. Originally from England, Mustang Sally currently resides in Montgomery, Texas, and enjoys playing outside with her pups and the Rashke family. Prior to moving to Texas and marrying Patricia, Don Rashke was the founder and CEO of a successful employee benefits services company based in Wisconsin. After they adopted Mustang Sally, the Rashkes set up Mustang Sally’s Kennel, and Sally and her pups later won many ribbons in dog shows across the country.